of their impact on Yammer or SharePoint. Our solution provides deep insights to measure engagement within your community, promote adoption, and increase overall ROI of the platforms. We collect the information that you need to empower your business line and your company visibility on the Microsoft networks. View usage statistics that enable you to trend the use of your tools over time across your organization. 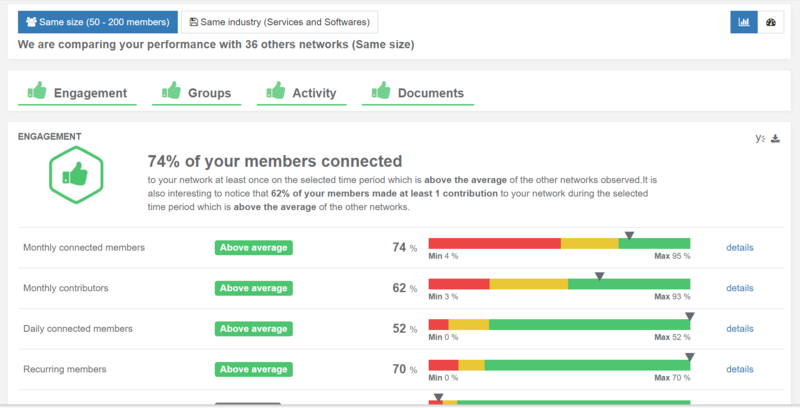 This allows you to see the level of involvement in each department, and to identify the most active and inactive groups. 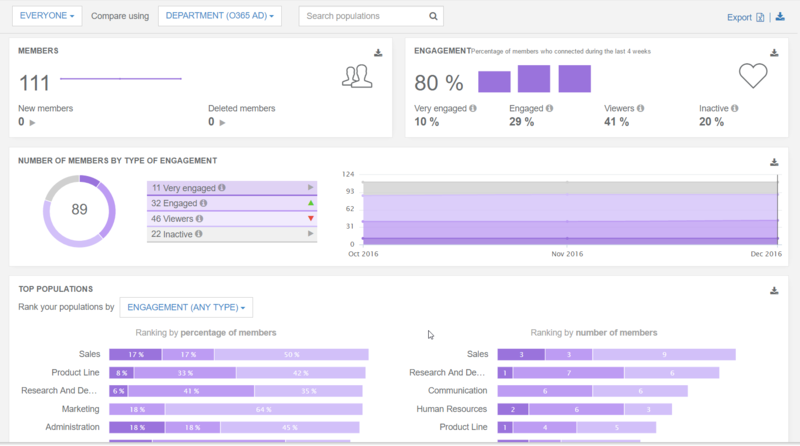 See engagement level: See contributions per user, team and department. Top documents: See who viewed them, downloaded them, and who the owner is. Benchmark: It provides a comparison by same size organization or within your industry. You can see their evolution, and you can position your company compared to others on every statistic you see on the screen. 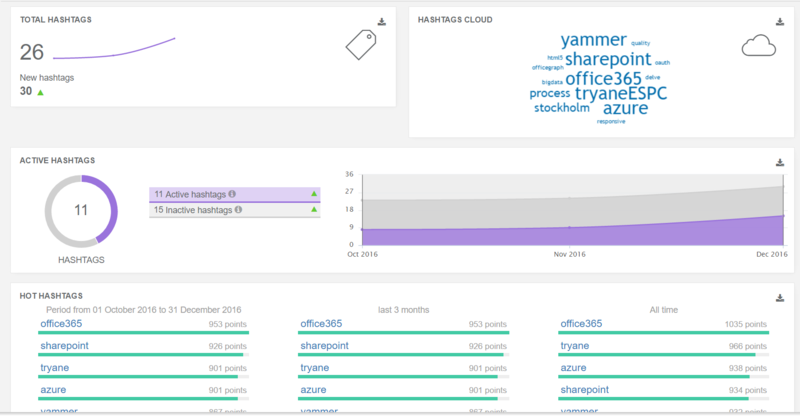 Model your populations to get pinpoint analytics: Modeling can be done via Yammer profiles, import of a simple CSV file to chart your organization, and soon via automatic synchronization with Office 365 Active Directory. At-a-glance display: Get a complete picture of statistics, easy to read and explore. Timeline feature allows you to drill down into the period you want to analyze. 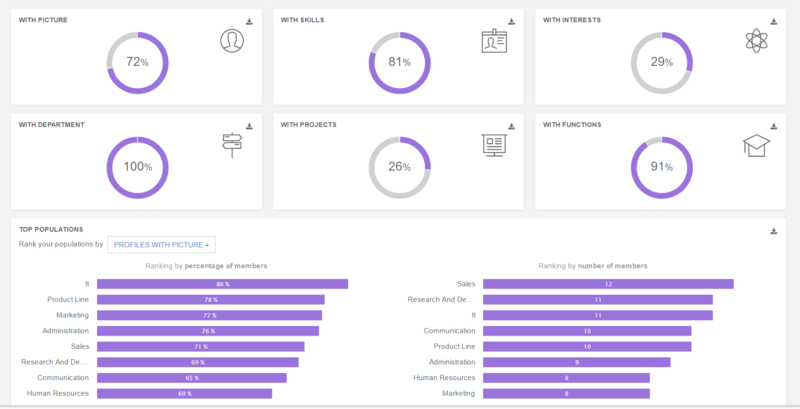 Every dashboard is fully customizable to show only the statistics that matter to you.